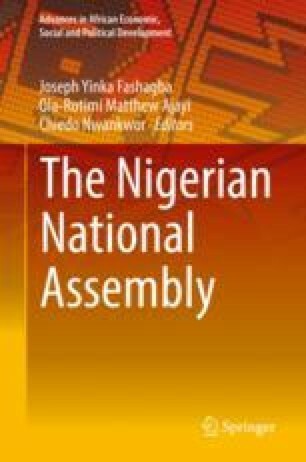 The chapter explores the workings of the House of Representatives as a legislative institution towards Nigeria’s democratic survival; using two parameters: Institutional framework and membership composition; and lawmaking effectiveness. The chapter observed lopsided distribution of legislative seats as some states with lesser population have more seats than those with higher population as against the spirit of its establishment. The chapter also found that despite the continuous increase in number of Bills received and passed, the lawmaking output was discouraging on the fact that only 546 Bills were passed out of 1926 Bills processed in 16 years at 28.3% performance level. Inter-Parliamentary Union. (2016). IPU PARLINE database: Structure of parliaments. Available on line at http://www.ipu.org. (accessed on October 25, 2015). Volden, C. and Wiseman, A. E. (2009). Legislative Effectiveness in Congress. Available on line at https://my.vanderbilt.edu/alanwiseman/files/2011/08/LEP_webpage_090710.pdf (Accessed on July 13, 2013). Volden, C. and Wiseman, A. E. (2013). The Lawmakers. Available online at http://polisci.emory.edu/home/cslpe/conference_2013/papers/Craig_Volden_Ch2_Ch4.pdf (Accessed on July 13, 2013). Wikipedia. (2016a). Unicameralism. Available on line at https://en.wikipedia.org/wiki/Unicameralism (accessed March 24, 2016). Wikipedia. (2016b). Tricameralism. Available on line at https://en.wikipedia.org/wiki/Tricameralism (accessed March 24, 2016). Wikipedia. (2016c). Tetracameralism. Available on line at https://en.wikipedia.org/wiki/Tetracameralism (accessed March 24, 2016).